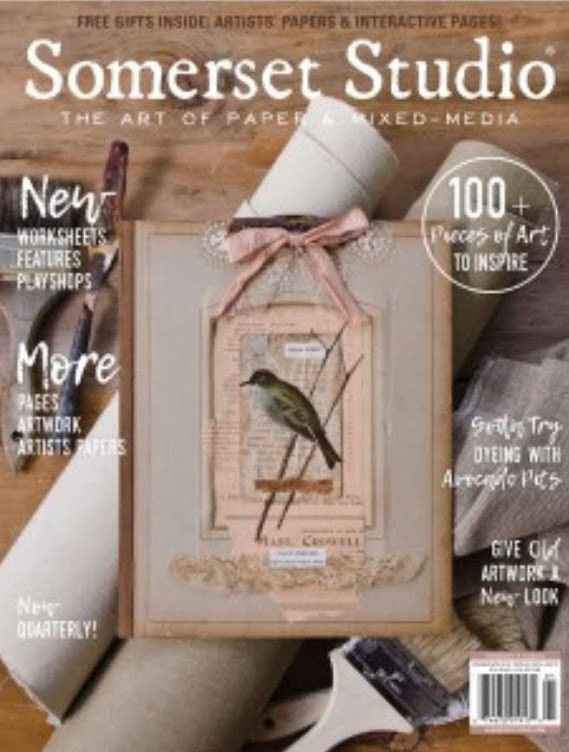 It's again my pleasure to be a Guest Designer on the PaperArtsy Blog! 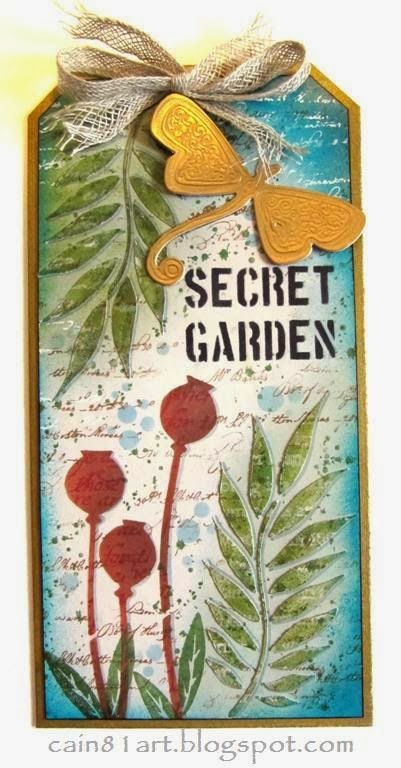 I simply can't get enough of the gorgeously detailed stamps by Lynne Perrella...and this set is no exception. 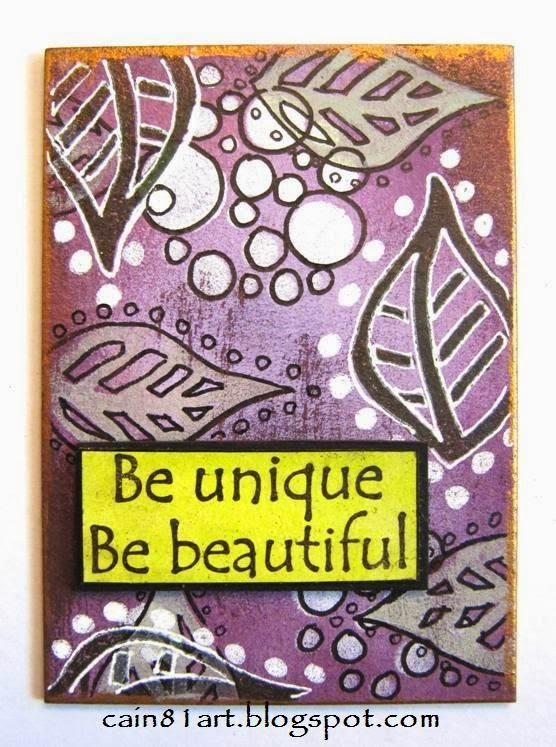 A full tutorial is over on the PaperArtsy blog. I'll lead you through the entire process, and you can find all the details and product links there. Don't forget to contribute to the contest and a chance to WIN FREE STAMPS! 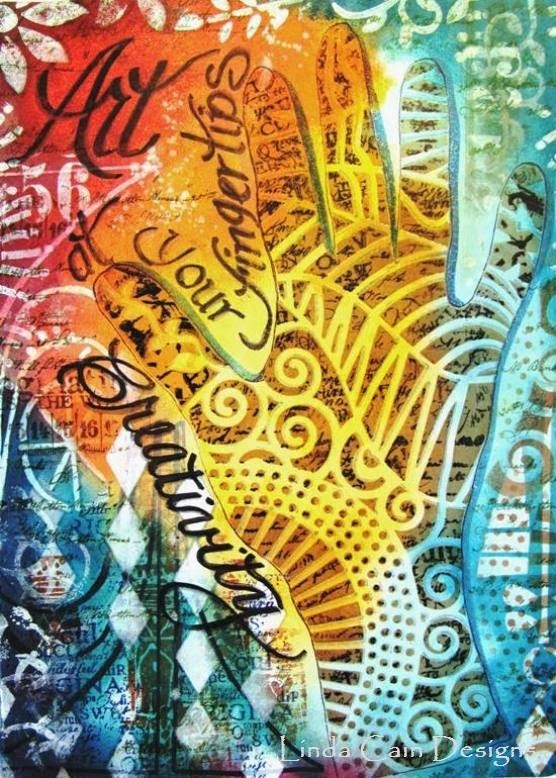 We'll use stamps, stencils, Grunge Paste, paints and more. So jump on over and take a look. Let us know what you think! It's an ugly day here, and I've been wanting to make some earrings for quite a while with the Brass Blanks and Embossing Folders from Vintaj. I thought I'd give the Patina's a try and see what happens. I had 4 - 22mm Brass Blanks and used 2 here to experiment. I decided to try them again and got 2 different images the second time. I used the Moonlit Night Embossing Folder. You just place the blank in the folder as shown and run it through an Embossing Maching as directed. I used the Metal Reliefing Block to sand and polish them. This shows a good image of a before on the left and an after on the right when you use this wonderful tool. Next I painted in the backgrounds. Don't be too worried about covering up a bit of the reliefing. You can sand it down again when it's dry. Then I turned it over and used the Wood Dapping Block to bend and shape the pieces. The Dapping does not hurt the paint. A hole is already punched in the blanks making it very simple to add an ear wire or jumpring for a charm. This was the result after I polished them up again. I just added them to a set of earwires that came with a copper ball! Try this easy technique. I used my Vagabond, but there are several embossing machines that work perfectly for this project. You can find the Patina's at Inspiration Emporium and use my iecain code for 10% off. The Embossing Folders are sold at Sizzix here. Some people ask me how I get such vibrate colors. Here is a perfect example of the number of colors I use to get the depth of color. I used 8 different colors of Distress Inks blending them into each other. With each layer you can see the color of the Manila tag fad so all you have is color. Deep, rich, color. I started with black embossing paste and 2 stencils. Then I layered on the inks. The Compass Coin and Curio Knob are added with the Label Pull that I found "imagination" fit perfectly in. Just a little something extra at the bottom with the Arrow from Industrious Stickers. 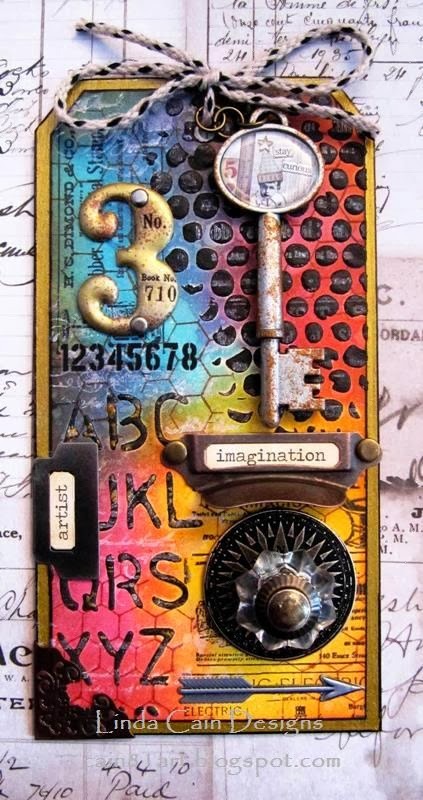 I loved how the Collage Key worked with the theme of "artist" and "imagination" by saying "Stay Curious". Something I think you must do to keep growing as an Artist. 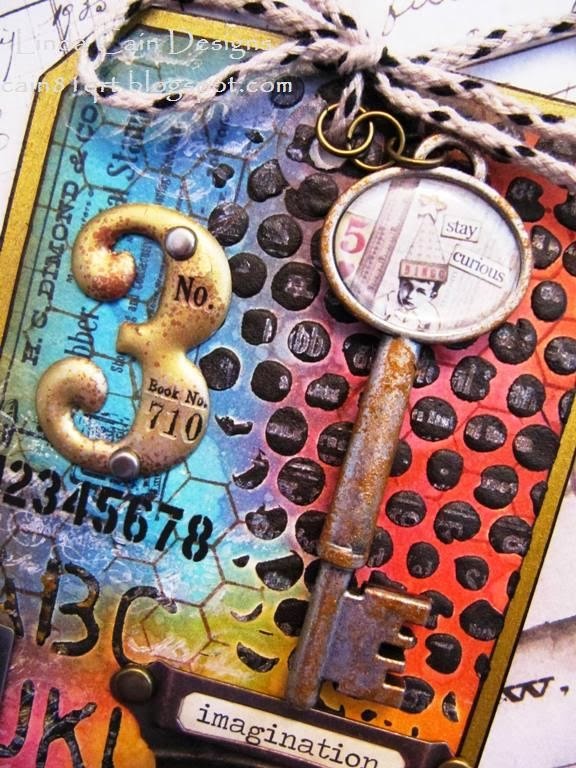 The key has several colors of Distress Paints dabbed on it to create an antique look. I used the Rubs on the Numeral 3 after I'd added 3 colors of Ultra-Thick Embossing Powder, and another Rub underneath it. Here you can see the Picket Fence paint stamping and Tarnished Brass on the embossed letters and chipboard. I thought "artist" looked great on the side in the little File Tab. The Naturals Trimming kept the tag in line with an earthy feel. Inspiration Emporium is having a sale on MANY of the items listed below. Check out the links and use my code iecain for 10% off your order! Distress Inks - Picked Raspberry, Antique Linen, Festive Berries, Peacock Feathers, Salty Ocean, Stormy Sky, Mustard Seed, Ripe Persimmon. 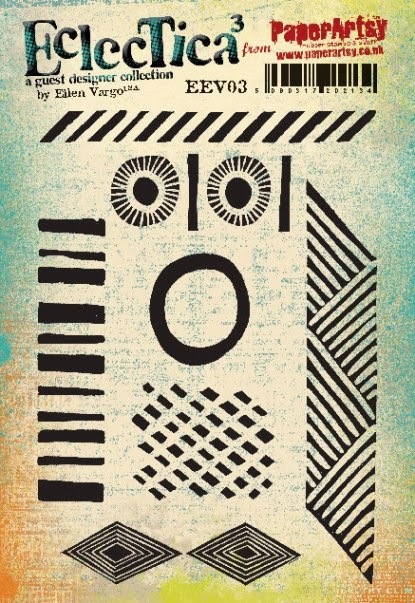 It's my turn again to play with StencilGirls Stencils over on their blog. If you read my blog, you saw the fun we had with the Artist Trading Blocks from Sizzix that went to CHA, so I thought I'd create a relatively simple one....really it is....trust me...and share it here. I literally took more time taking pictures than I did making this! It's that easy once you get things rolling. I just set it on an unfinished wooden pedestal here so you can see it better. They start out like this with 2 pieces cut from mat board. You can use any size "block" you like. They come in various sizes from 1 1/2 in. to 3 1/4 in. squares. I painted the edges all around with black acrylic paint. Bend the mat board so you can get the paint into the creases. The Scoreboard that cuts 3 different sizes from Eileen Hull should be in stores in February. See it here. The 3 1/4 in. one can be seen here. This one is 2 1/2 inches. 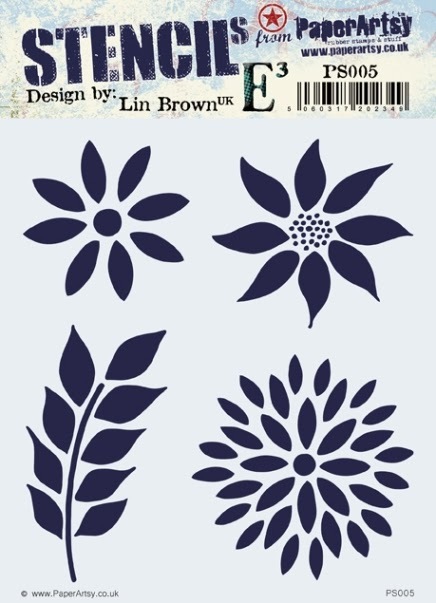 I cut 6 pieces of Specialty Stamping Paper 2 1/4 in. square so I have a border around the papers. Then I randomly added, without trying to make a big deal out of it, Picket Fence, Festive Berries, Dusty Concord, Seedless Preserves, Tarnished Brass, Brushed Pewter, and a bit of Antique Bronze Distress Paints. Spritz with water to let them run. Here the picture shows up more "reddish" since it's under artificial light. The lower left one, you can tell, didn't get enough water....or so I thought. But it turns out just fine once you stamp on it. The Compass piece is the one I didn't think I'd like as well, but all of them turned out great, and different. The Pewter is really cool on the Dragon Fly and Brushes, but just shows up gray here. I used the Mixed Media Chicken Wire stamp and Sepia Archival Ink to randomly stamp each square first, and them Jet Black Archival Ink on the other images. Even the bottom gets a stamped image. Here the brushes are from Tim's Artful Tools Set. The Eye is from Oddities. The Butterfly on top is from Papillon, and the Dragonfly, Compass and Pear are from the Classics #1 Stamper's Anonymous sets. A glue stick works great for adding the paper to the block, and the last thing is to add Wonder Tape to the 4 tabs and put your Block together. Pay special attention to the direction of the pictures when you glue the papers to the blocks. The 2nd set of pictures are a bit tricky to figure directionally. Most products can be found at Inspiration Emporium by clicking the links above, and you get 10% off your order when you use iecain81 for a coupon code. Ellen Vargo Eclectica Designer !!! 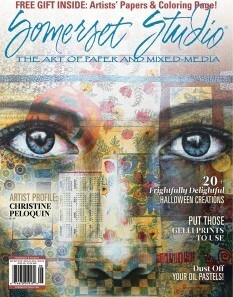 Welcome the newest Designer for PaperArtsy!!! Ellen Vargo! I love her chunky stamps for making backgrounds. 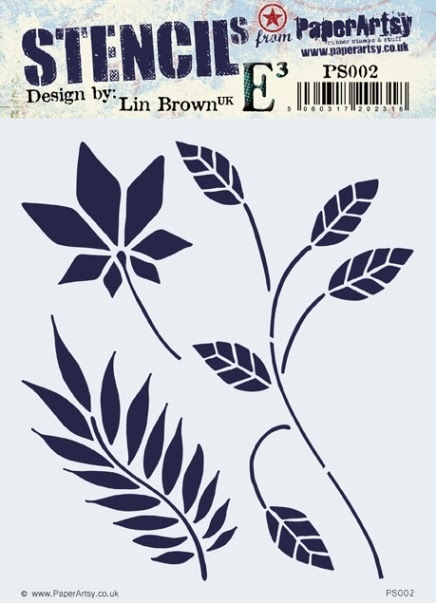 Leandra thought a mash up with Lin Brown's hand-carved Garden stamps would be great fun! This is some of the purple Frescos again and the the gorgeous blues blended all around for a background onto a #10 tag. Then I stamped with Spanish Mulberry and Baltic Blue paint, and used Versafine Imperial Purple, Majestic Blue, and Vintage Sepia inks. Sometimes I used 2 colors to each stamp as you can see in the lower right corner. 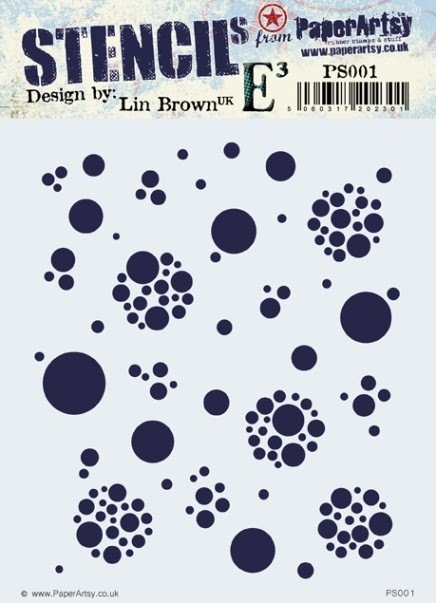 The Snowflake stenciled bubbles PS003 and stamped images make great contrast. 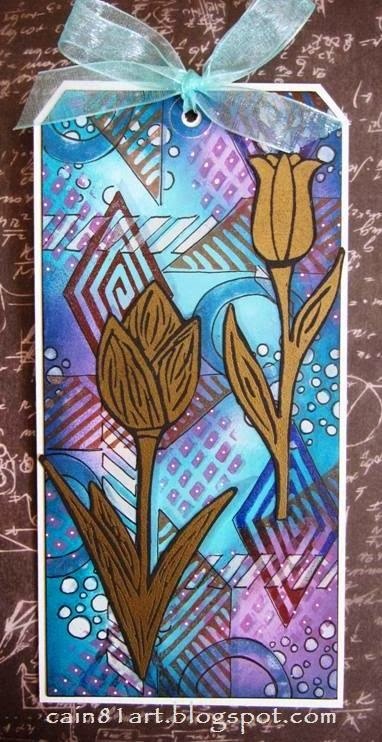 I stamped the Tulips from ELB02 and ELB04 onto black cardstock and embossed with gold embossing powder. Cut them out, and glued to the tag. Outline with pens and add some dots. This is layered onto white watercolor paper. If you like bright, you'll love this. And it is THIS bright in person! The Haystack, London Bus, Tango and Blood Orange with just a touch of Claret make up the background. Clear Embossing Powder. Red archival ink and Carmel paint were used here, too. Then I added Snowflake paint and Sepia ink to EEV02 images and stamped. The beautiful phrase stamped in black archival ink jumps right out at you. This is the #8 tag with the same type of background, but with different, more muted colors and EEV04. The background has stamps from EEV03 here again, too. 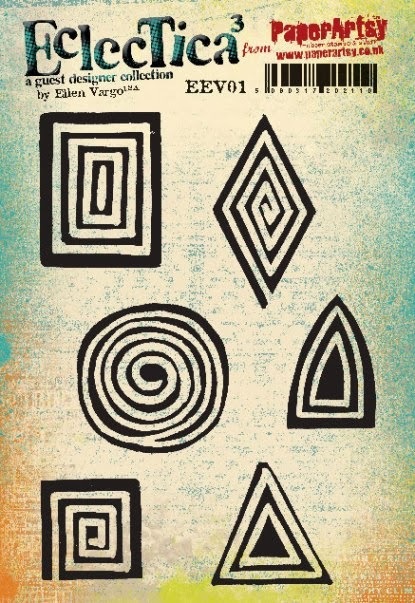 I also used these gorgeous hand-carved stamps from EEV04. 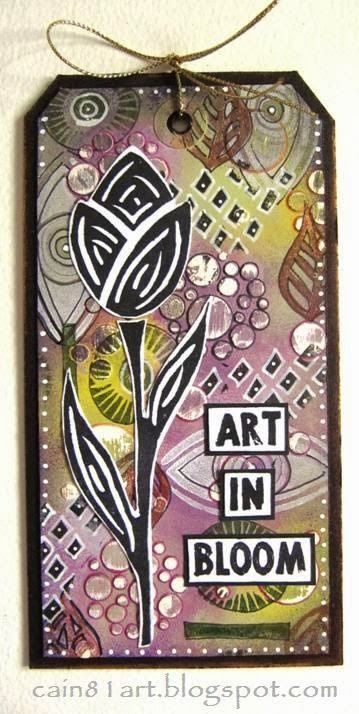 I stamped the phrase ART IN BLOOM on white stamping paper from ELB01. 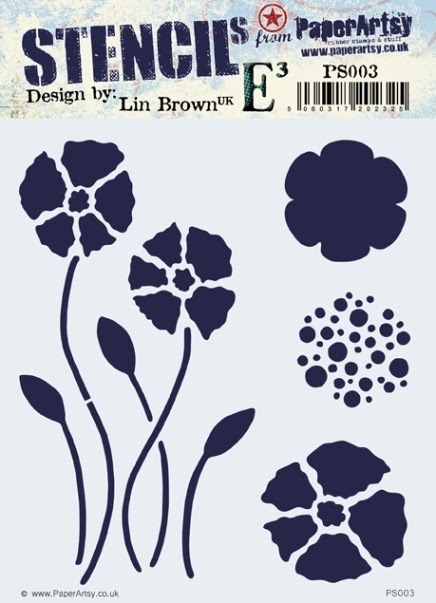 And used the ELB03 collection for the flower that I cut out and layered onto the tag. Lin's Bubble stencil was perfect here with Grunge Paste that I sanded back to reveal colors underneath. 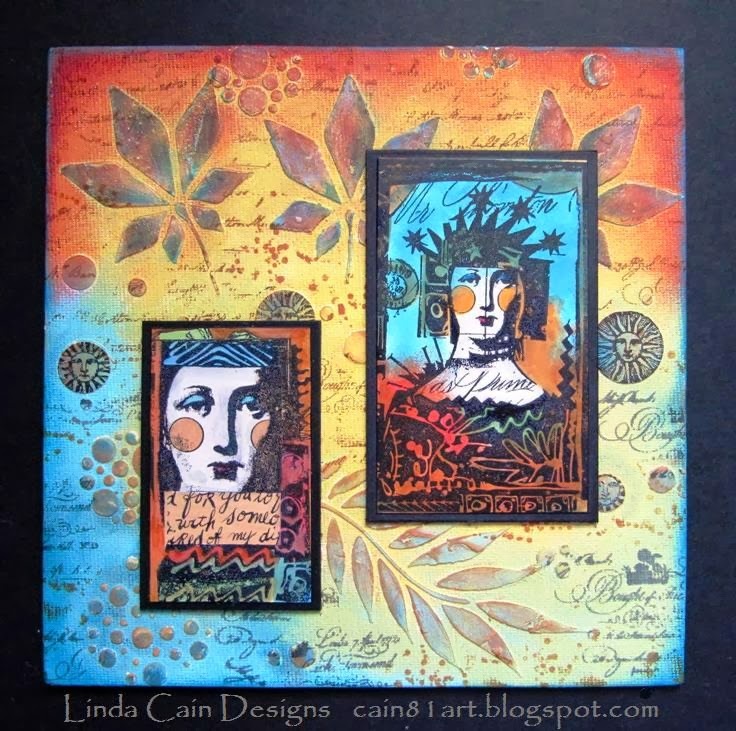 And here's a little ATC mash up for fun with Florentine Treasure Gold on the edges, Lin's stencil and Ellen's fabulous leave stamps. 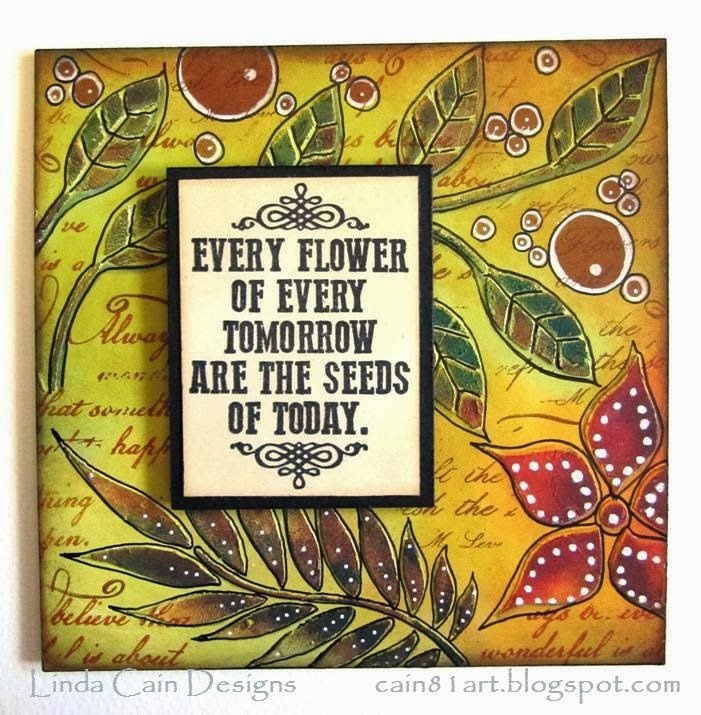 The Phrase is from the Darcy collection EDY06 with Zesty Zing on white stamping paper. Just grabbed this shot of our projects at the Stitches Trade Show in the UK. Get them while they're hot, people! That's it for me, I'll be back later this month with a tutorial and another fun project. Let me know what you think!!! 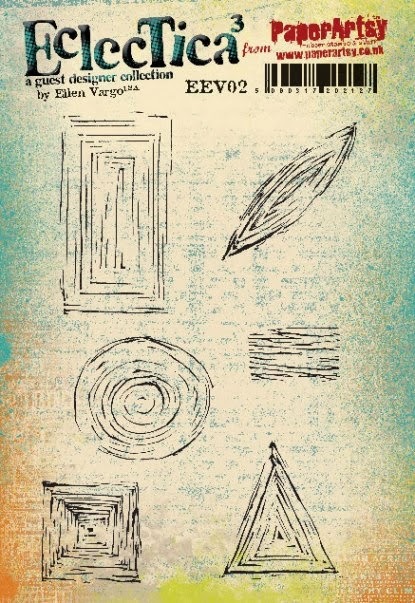 for more projects from great designers using the new stamps from Ellen Vargo! Be sure to ask your LSS about these stamps! I LOVE Lin Brown. One of the sweetest, most talented and sharing gals I've met in the Industry. So when I was asked to work with her NEW stamps and stencils for "Stitches", I was really excited! This is an Articulated Doll Ornament from Retro Cafe Art that I painted white with Snowflake. 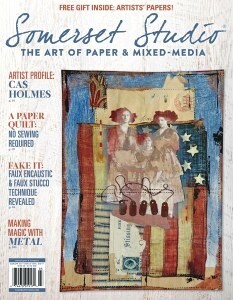 Then I used Lin's NEW Fresco Paint colors and archival inks to stamp images on her. She has a Grunge Paste stencil design on her skirt that's been painted and stamped. 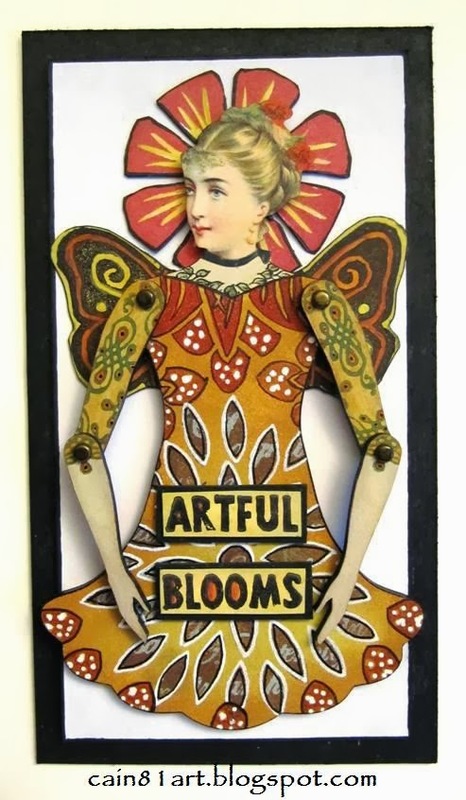 I layered the Artful Blooms onto chipboard to add depth. I use stamps from different collections all through these samples. I used the top of the Tulip stamp to edge her skirt and create the neckline. The Flower to make the halo around her head. The Butterfly is cut in half for her wings. The designs on the green sleeves are from the bottom of the "Every Flower" stamp. I used Sage Fresco Paint to stamp the large word phrase on top of the stenciled skirt. And these are Lin's new Fresco Paint Colots!!! 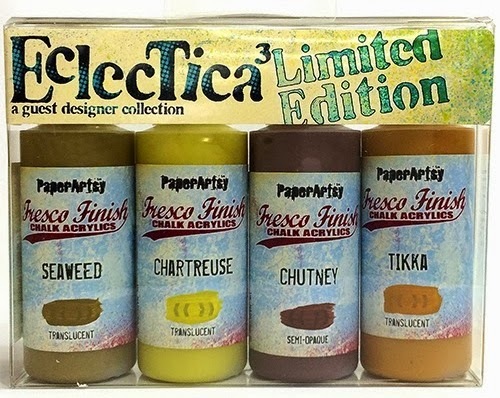 Seaweed, Chartreause, Chutney and Tikka! I used them all in these projects! LOVE! This background was created first, and then a layer of GrungePaste was added using the fern leaves. I added more layers of paint when they were dry. Then I added stamped words and Treasure Gold. 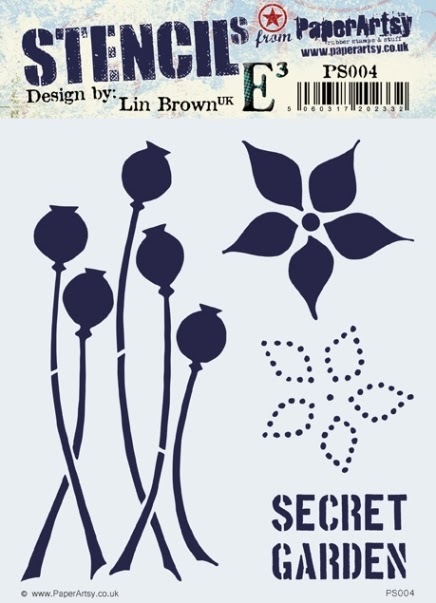 The Flowers and Secret Garden were stenciled with Archival Inks. A few more bubbles and word stamps fill in the blank spots. This is a 6x6 white chipboard piece with stenciling over the painted background. I added more layers of paints, stamps, and penwork in black and white. I love laying the stencil back over the image to add more paint and stamping. The phrase from ELB06 is layered onto black chipboard and added with foam squares. The script phrase from that set is also stamped in brown archival ink around the background. 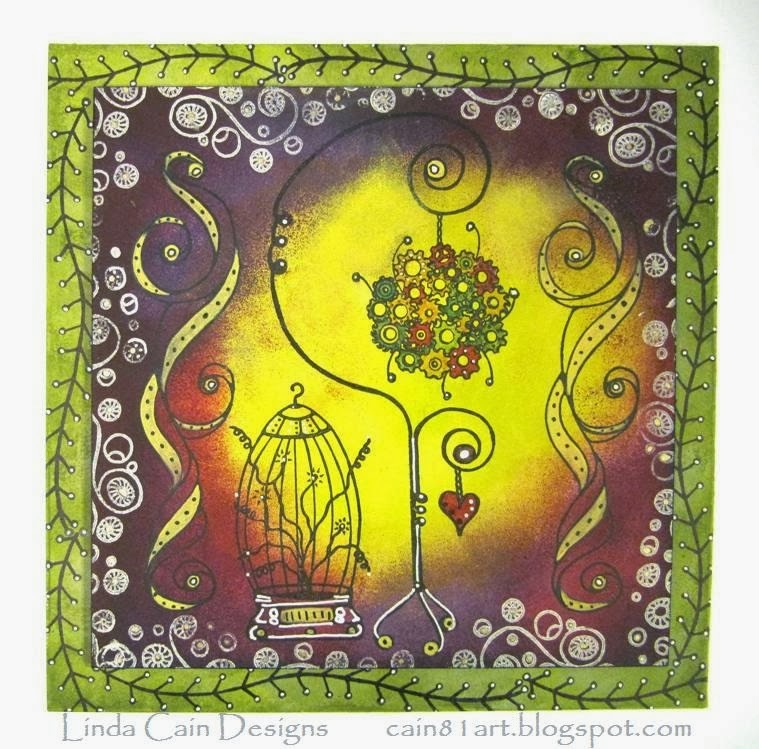 Now jump on over to the PaperArtsy Blog for more samples using Lin's beautiful products from other Guest Designers! And don't forget to ask your LSS about these stamps! 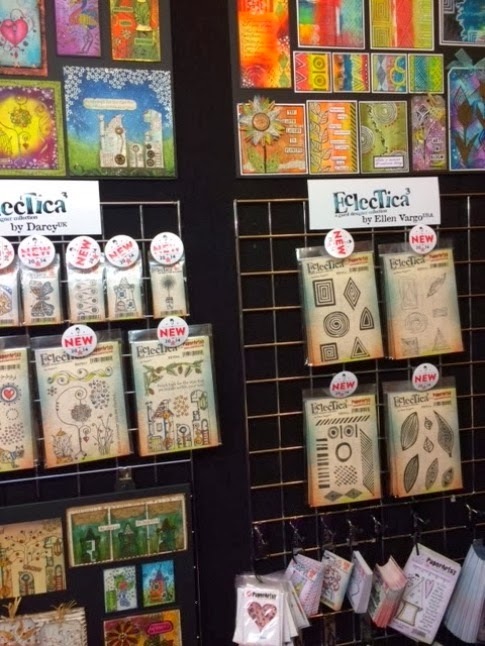 I was so thrilled when Leandra, aka Mrs. PaperArtsy, asked me to create samples for the Craft Hobby and Stitches Trade Show. It's call "Stitches" for short, and is the UK's annual and largest trade-only event. And there were some new Designers brought on with great new stamps and products. 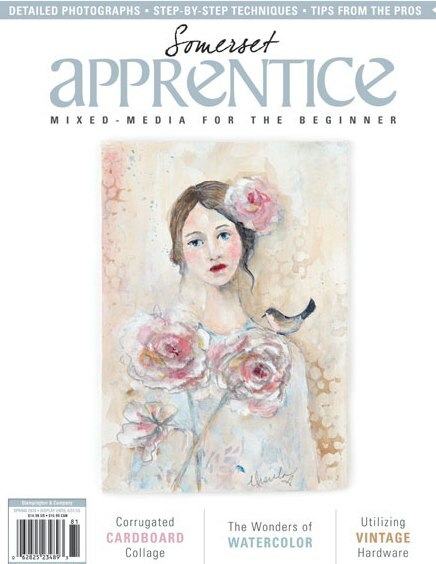 This collection is from the crazy-talented Darcy! 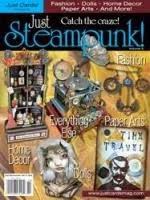 Gotta love the Steampunky goodness here. New stamps and Fresco Paint colors on a large size 10 tag. You cannot beat stamping on Fresco Paints!!!!! I use all the plates throughout my examples here....this one starts with EDY08 and adds details from 05, 06 and 07. White pen and translucent Frescos are added after the base coat and stamping. Is this a HOOT, or what? New to me "purples" in the Frescos....Lilac, Pansy, Amethyst on a #8 tag. 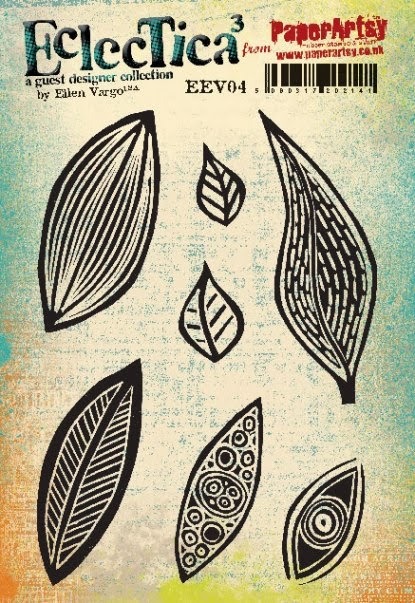 Love the Flourish at the top, too, from EDY05. The phrase and flowers are from EDY06. 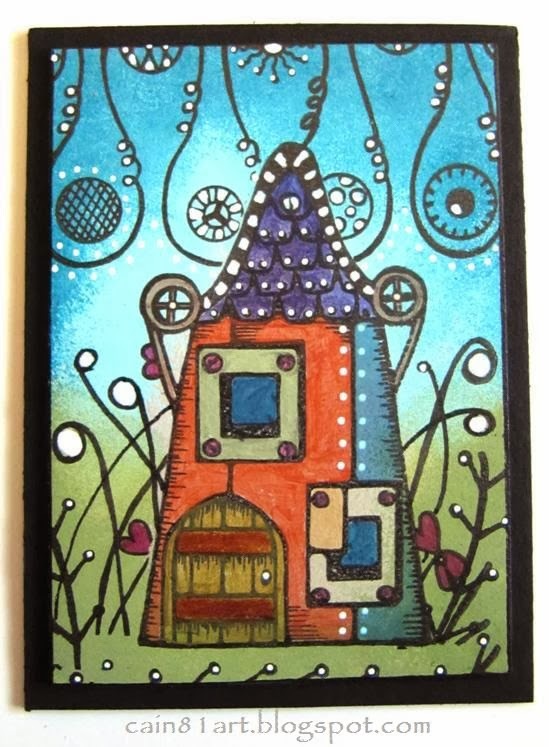 This is an ATC with Paints and markers. The little house fits perfectly onto an ATC from EM05-08. When you start with a WHITE background, the Fresco Paints remain soooooo vibrant you won't believe it! I cut a 7x7 piece and painted with Hyde Park and Limelight then stamped the border from EDY08. I used this as a frame and added the smaller one on top. Lots of white pen marks make the colors come to life! When you add these fun stamps with black permanent inks you can then uses translucents paints over the images and not loose the detail. 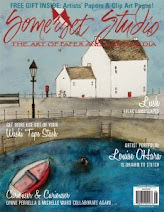 Check out the new REVEAL over at the PaperArtsy Blog with more samples and REVEAL information. 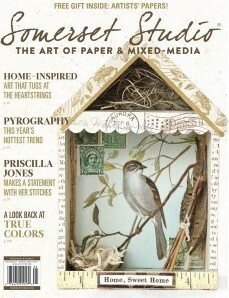 PaperArtsy will release everything to stores at the stitches trade show, Feb 16,17,18. So be checking with your LSS.